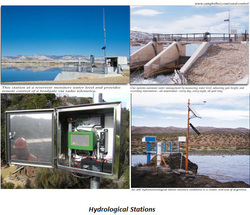 Al-Worod Al-Dania ES Co. - hydrology - Al-Worod Al-Dania ES Co. In the practical applications, it is common to measure meteorological and hydrological parameters in the same system to determine cause-and-effect relationships. These stations and systems for unattended, long-term monitoring of water quality provide unmatched versatility and reliability. Our systems measure water quality in many natural and industrial environments including streams, watersheds, wells, caves, water/wastewater treatment plants, aquaculture operations, landfills, and processing plants. Key components of our systems include data loggers, sensors, and communications peripherals, which are customized for each application. The benefits & characteristics of these systems are: ˃ Measure &record water level, flow, water quality parameters, water speed and direction. ˃ Control gates, alarms, motors, valves, and other electrical devices. ˃ For water quality measurement, the stations have multi-parameters probe measuring PH, temperature, redox, dissolved oxygen, conductivity, salinity, turbidity, NH4, N-NO3, P-PO4, total organic carbon TOC, Cl. ˃ We supplied also laboratory analytical instruments for different parameters of water quality. Tell us what you need and we'll help you configure a system that meets your exact needs. Most of the sensors and multiparameter sonde other than that we supplied usually ,can be configured with our data logger systems supplied from Campbell Scientific Inc.
Water Quality Sensors we supplied from Campbell Scientific Inc.
Dam water level monitoring with Campbell Scientific Inc. system. Samples of multi-parameters sonde for water quality which was configured with our CR850 data logger.